Four AMDA alumni are on the road with the upcoming touring production of Bullets Over Broadway, the hit musical by Woody Allen (original choreography and directing by Susan Stroman). Opening in Cleveland on October 6th, the production reflects the creativity of AMDA alumnus Michael LaMasa (Assistant Director) and features the performance talents of alumni Bradley Allan Zarr (Warner Purcell), Jemma Jane (Olive Neal), and Carissa Fiorillo (Ensemble). Alumnus Michael LaMasa, who has a firm creative hand as the assistant director, has collaborated with some of Broadway's most legendary voices on both sides of the directing table since graduating AMDA in 2007. The seasoned performer recently appeared as Don Lockwood in Singin' in the Rain, Sparky in Forever Plaid, Albert in Bye Bye Birdie, and several productions of 42nd Street. Despite his impressive résumé, Michael was a bit surprised to earn the coveted position of assistant director for Bullets. The opportunity stemmed from his previous work with director Jeff Whiting, who was the associate director for the show’s Broadway run with Susan Stroman. Michael had assisted the Broadway production of Bullets by implementing Whiting’s mobile app Stage Write, which streamlines staging and choreography. For Michael, assistant directing the Bullets tour involves navigating the often tricky process of adapting a Broadway show into a fully-mobile touring production, using canny judgment to tweak beloved set pieces for practical concerns. While creatively rewarding, the job presents a unique set of challenges for artists who love the original production and wish to retain its creative essence. Fortunately Michael’s former classmate, accomplished touring performer Bradley Allan Zarr, brings a degree of familiarity in his role as Warner Purcell. Brad previously appeared in the national tours of The Drowsy Chaperone, Spamalot, Catch Me If You Can, and most recently Kathleen Marshall's Anything Goes. In addition, he’s performed as the principal singer aboard Norwegian Cruise Lines, originating the Burt Bacharach jazz review The Look of Love. "Brad and I crossed over a little bit," Michael recalls of their time at AMDA. "He’s playing the role of Warner Purcell as well as taking on the part of our dance captain and on a show like this, that is no easy task. Bradley wears multiple hats on this project and does so very well. As our dance captain, we get to work together a lot to make sure the show is in prime shape, and he is incredibly professional and concise. As Warner Purcell, he’s just absolutely hysterical. He’s a complete delight to work with and he’s going to steal the show." Bullets Over Broadway also stars recent New York graduate Jemma Jane as lead Olive Neal. Prior to her enrollment at AMDA, Jane was already a seasoned performer in her native Australia, appearing in Little Shop of Horrors, Cabaret, Miss Saigon, Joseph and the Amazing Technicolor Dreamcoat, and Rent. "I think this is her first show right out of school, and she's nailing it," says Michael. "I'm so proud of her. She's such a little spitfire of a gal. She's the tiniest person up on stage, but she's got the biggest personality and she's just incredible to watch." Jemma has the unique challenge of giving a likable performance of Olive, a character who can be anything but: "Olive is such an interesting role, because it requires her to utilize this really obnoxious, harsh character voice, which she does very well. Jemma will find moments in the show where she is able to let loose and let her actual voice come out through the character voice, which she does so well." Rounding out the production's quartet of AMDA alumni is ensemble player Carissa Fiorillo, who acted as dance captain for the national tour of Guys and Dolls and performed as a Radio City Rockette in New York City. "Carissa was actually one of the last people that we hired for the show, and I was in the room when we hired her," recalls LaMasa. "She's a performer that you literally cannot take your eyes off of when she's on that stage. She's the epitome of a Susan Stroman girl. She's doing a wonderful job." Michael, a seasoned performer himself, admits a tinge of jealousy for the actors he directs. "I'm a tap dancer, so of course the tap dancing in this show is my favorite. It kills me to not be up there with these boys just tapping my brains out. But it's really magical to sit back and watch these guys do what they do." While Michael’s talent and work ethic got him hired as the assistant director for Bullets, he's quick to cite his education as a cornerstone to his success both in and out of the director's chair: "My AMDA connections have been just astounding and wonderful, and it's always been something that's been incredibly helpful to me... My sense of professionalism and my ability to learn came from some really exceptional teachers that I had at AMDA." AMDA’s influence isn’t specific to him. "…I've never once done a job without some type of an AMDA person with me. Every job I've ever had has either had an alumni in the cast with me, or I've had someone on the staff that's been a part of it, or I've gotten the job through an AMDA connection. AMDA is always with me. It's networking to the extreme." 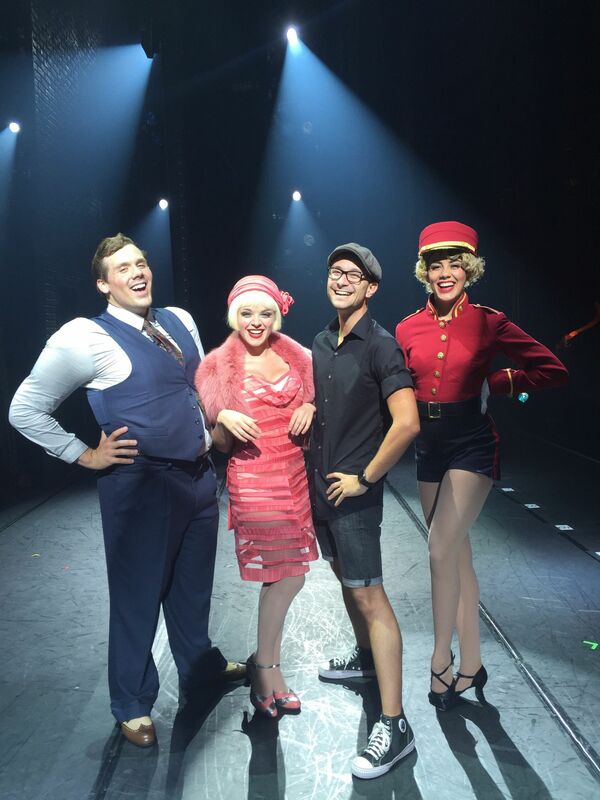 For Bullets Over Broadway, the connection has brought an increased sense of joy to the production, fostering a unique camaraderie among the four AMDA alumni. "Working with Bradley and working with Jemma and Carissa, it's been really nice to continue that family feel,” said Michael. “I've always felt that AMDA provided me with such a great family and such a great sense of strength. Everywhere I go, I feel like I'm never alone." Bullets Over Broadway will open in Cleveland on October 6th and will tour until July 2016, including a stop at the Pantages Theatre in Hollywood from January 5–24. For more information, visit bulletsoverbroadwayontour.com.